Ahoy, friends! 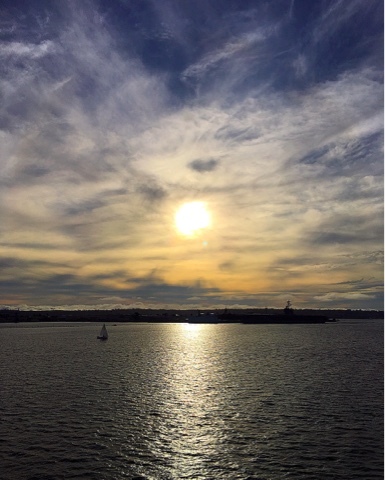 I had the opportunity to visit San Diego and Coronado Island last weekend. It was only a few days but I tried my best to make the most out of my time there. 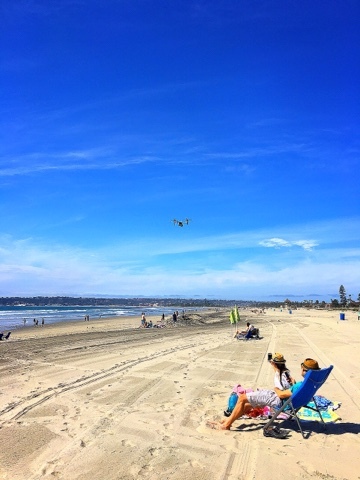 I always forget how close San Diego is and have no idea why I don't visit more often! The drive was only about 2.5 hours - so easy! I may have said this before but California is such an interesting state. While I don't think it's necessary to split California in two states like some people do, I see why. In my mind, there's Northern California (San Francisco, Oakland, etc), Mid California (Los Angeles, Anaheim, etc) and Southern California (San Diego). All 3 areas offer such different cultures! I love it. 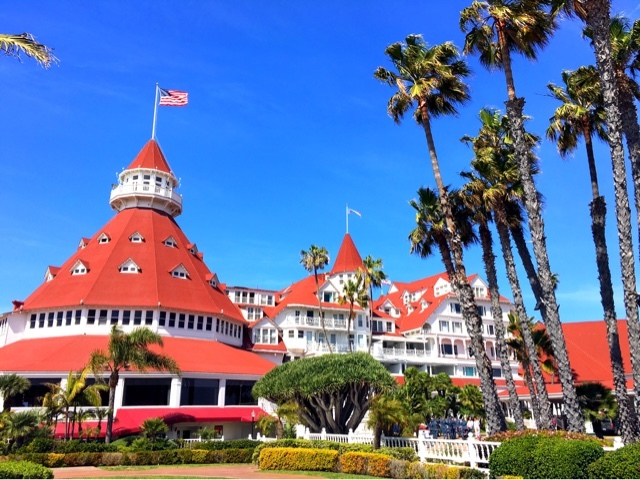 Hotel del Coronado - Classic. Historical. Beautiful. It's a National Historical Landmark and the second largest building made out of wood (thanks, Wikipedia!). You don't have to stay at the hotel to explore it so I highly recommend a visit when in San Diego. My favorite thing to do is walking through the hotel out to the beach. 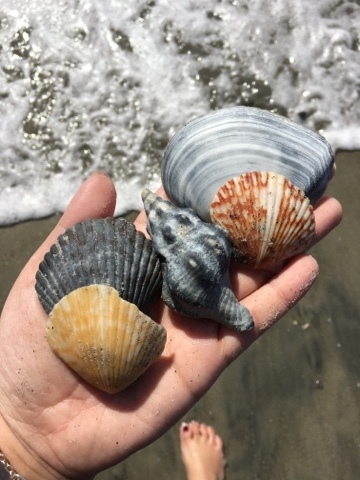 The beach has the softest sand and a crazy amount of shells! So many people were picking up shells, children and adults alike. 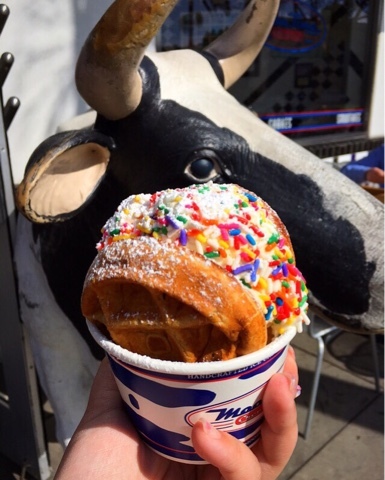 MooTime Creamery - You can't miss this ice cream shop as you drive through the island. The life-size cow and Elvis will catch anyone's eye! Their diner-vibe ice creamery serves delicious treats. My favorite is this waffle ice cream sandwich with sprinkles. I got the Birthday Cake ice cream sandwiched and was basically in heaven. Yum! Leroy's Kitchen & Lounge - An urban, farm-to-table restaurant that I randomly chose through OpenTable. I enjoyed the charcuterie board (I love charcuterie boards! ), poke tacos (one of their most popular items) and the burger - don't worry, I didn't eat all of those! Unfortunately I was too hungry and the lighting was so dark to take any pictures. 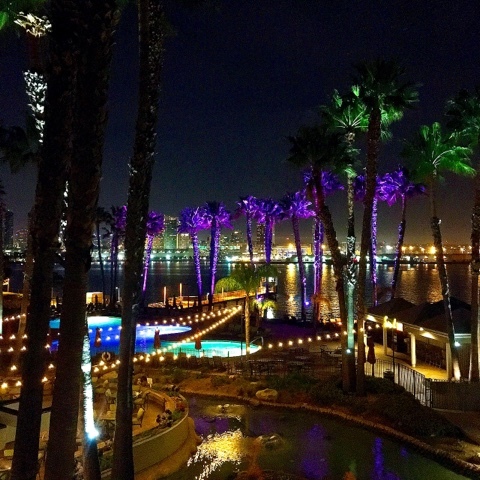 Coronado Island Marriott Resort & Spa - Even though the property is mid-renovation, I had a great time. The lobby is beautiful and thankfully my room was in the newly renovated building. My favorite part though, was their outdoor patio restaurant. 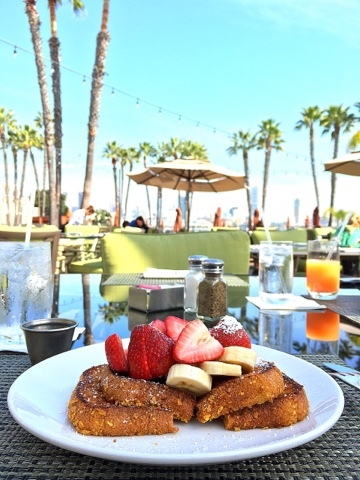 I enjoyed breakfast there, specifically a Cornflake Crusted French Toast with the most beautiful view! Meze - This Greek fusion restaurant is located in the Gaslamp area in downtown San Diego. This was another randomly chosen restaurant after scrolling through Yelp and I'm so glad I found it! I love Greek food and Meze did not disappoint. Their tapas style dishes were all so delicious but my favorite were the baba ganoush and their cheese dish. 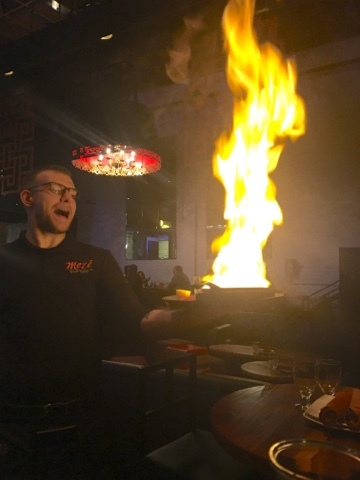 They light the cheese on fire and it goes up in flames! I'm actually not a huge cheese fan but I was on board with this one! Yum! 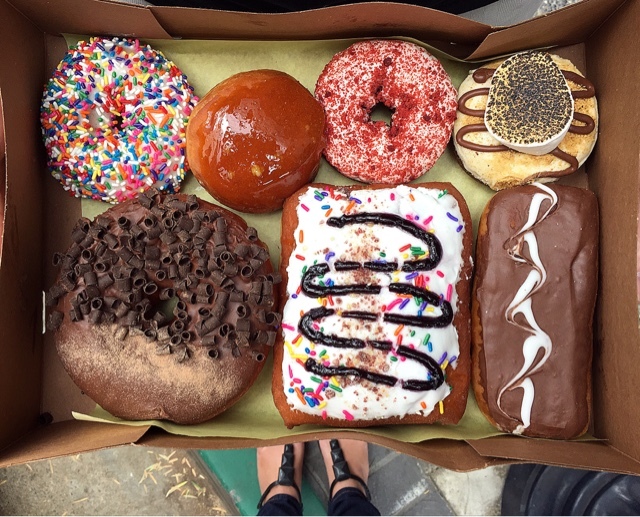 Donut Bar - If you follow me on Instagram, you know I have a sweet tooth. 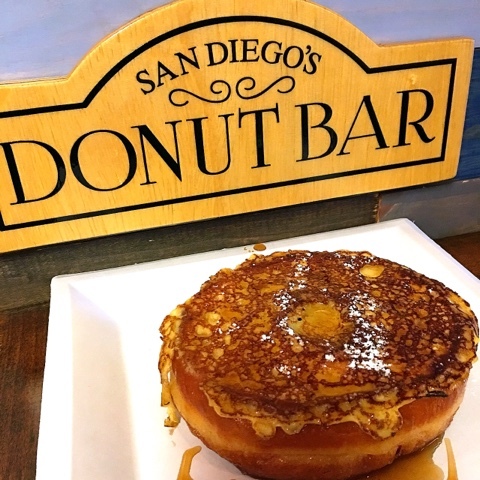 When I heard San Diego had one of America's most popular donuts, I had to go. After reading about the long lines, I decided to make the smart move of ordering online for pick-up the day before. When I got there around 9:40AM, the line probably had about 50 people? Crazy! Since I ordered online, I was able to go right to the front for my pick-up. Once I paid for it, I went upstairs to eat the French Toast Donut since it was made-to-order and wanted it to be fresh! Yum! I have to say, anyone can decorate their donut so it's Instagrammable but not everyone can make it delicious as well - Donut Bar does both! 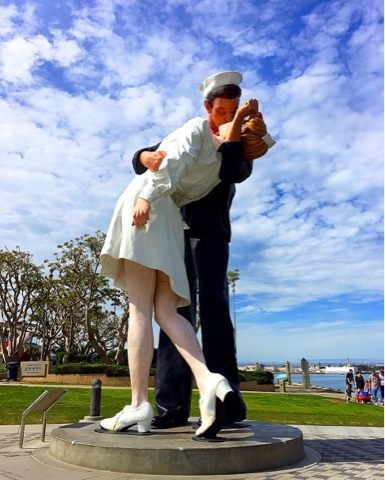 Unconditional Surrender - Also known as "The Kiss", the statue is right by the USS Midland Museum and a very popular place for couples to take photos (my friend actually proposed to his now-wife there!). It's 7.6 meters (25 feet) tall and gorgeous, especially as the sun sets. Certainly a sight to see! 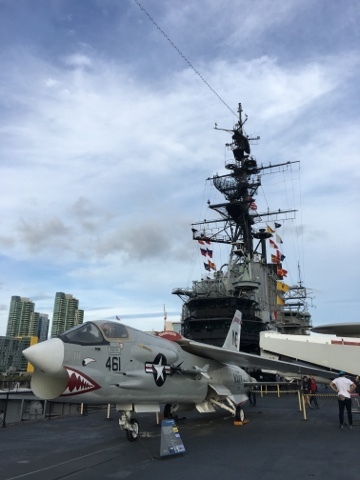 USS Midway Museum - I've been to countless amounts of museums and this has officially taken the top spot. I was there for 6.5 hours and didn't want to leave! The museum is an actual U.S Navy aircraft carrier called the Midway, that was active until 1992. Exploring through the carrier is a fascinating experience, getting to see where 4,000 servicemen spent months protecting our country. It's a very interactive museum; you have access through the bunks, kitchens, offices, laundry rooms, etc. In my opinion, what truly made the museum what it was were the docents. The docents were all former servicemen and the stories they had of their experiences were mind-blowing. They were all proud, open to chatting about their past and extremely knowledgable about the Midway. I personally wish I could have taken a few out to lunch just to listen to them talk! An entire day was spent here and I don't regret it one bit. In fact, I can't wait to go back soon! As always, thank you for stopping by! I really enjoy the comments and messages you send me after reading some of my posts. Next week I'm off to Seattle but for a very special reason: Bloguettes workshop! Looking forward to sharing that experience with you soon! YUM!! 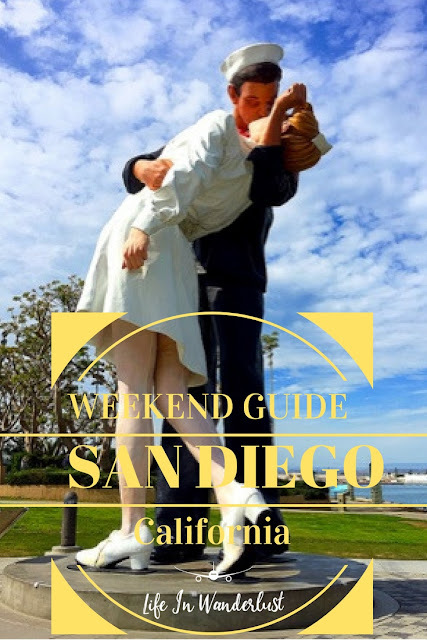 Looks like you found all my favorite spots... the only one I think you missed was the creperie in Coronado ;) Glad you enjoyed yourself!!! Ops! It looks like you meant to type "USS Midway Museum" not "USS Midland Museum".